Serenity Moments® provides the ultimate relaxation experience offering beautiful, scenic relaxation videos on DVD, Blu-ray disc or USB hard drive—for those who wish to offer our videos in their patient/guest rooms. Our relaxation DVDs feature spectacular scenery filmed in high definition video and include beautiful relaxation music, ambient nature sounds as well as Alpha, Theta and Delta brain wave frequencies to relax the brain. Our doctor recommended relaxation videos provide tranquility and are ideal for those interested in Health & Wellness, stress management and insomnia or anxiety relief. Our relaxation videos are used by relaxation therapy profesionals in hospitals, cancer treatment clinics, dental offices and waiting rooms. Our relaxation dvds are also used in hospital relaxation channels, by doctors, dentists, psychologists and massage therapists to help patients relax during treatment, recover from surgery, trauma or illness. Our ambient dvds are also used as tv screensavers by those who just want to relax after work and enjoy our music videos as a meditation dvd and by those who practice yoga or meditation. 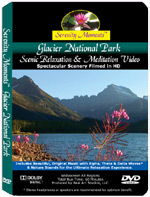 Our scenic relaxation videos can be licensed for video-on-demand (VOD) and closed circuit television (CCTV) programming. The Serenity Moments relaxation DVD and guided meditation video series was designed for stress relief, relieve PTSD symptoms as well as relaxation therapy for anxiety management. This beautiful relaxation DVD with beautiful meditation music and nature sounds is used by hospitals, therapists and clinics and dentists to help patients relax during treatment and after surgery and as an effective PTSD treatment tool for vets returning from the war zone. They are recommended by Dr. Ronald Turco, a widely recognized psychiatrist and M.D. The relaxation DVD is also recommended by M. Brandon French, Ph.D. as an instantaneous escape from anxiety and stress-related disorders. The relaxation DVD is also used by cancer treatment clinics, dentists and hospitals to help patients relax during treatment and recover after surgery. Our relaxation DVDs are also used by the healthcare industry in waiting rooms as ambient video. The Serenity Moments relaxation videos feature spectacular scenery enabling you to escape to a virtual vacation in paradise as often as you like while lulling you into a state of deep relaxation. Our tranquil and serene scenic relaxation DVDs include soothing relaxation music, ambient nature sounds and Alpha and Theta brain wave frequencies—a clinically proven method of helping the brain to enter a deeply relaxed state via brain wave entrainment. Our relaxation DVD has been hailed as a major medical intervention by a leading clinical psychologists in clinical trials and with continued use can be a useful brain entrainment tool and healing aid. 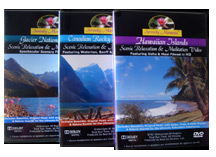 The Hawaiian Islands relaxation DVD also includes an optional guided meditation soundtrack. Listen to a short sample by clicking here. The guided meditation will help you learn how to meditate, manage stress and help reduce anxiety so you can relax. The guided meditation session includes guided imagery, beautiful meditation music, and a progressive muscle relaxation session and includes deep breathing exercises. It also utilizes hypnotherapy techniques to help you achieve deep relaxation as you enjoy beautiful scenery. Cognitive behavioral suggestions are then offered to the subconscious mind to encourage positive, optimistic thinking and promote healing of the mind, body & spirit. While there are many ways to meditate, you might find our unique meditation technique will provide you with a profoundly beautiful experience and a very effective method to achieve deep relaxation. Our guided meditation script is based upon brain research and was developed with the cooperation and approval of clinical psychologists and is doctor recommended. It incorporates hypnotherapy techniques and cognitive behavior suggestions designed to resonate with your subconscious mind and enable you to retrain your brain so you may lead a healthier, happier and more rewarding life. The Serenity Moments relaxation videos with meditation music will induce the relaxation response in the brain and mitigate hyperactivity of the "flight or fight" response. With repeated use, you may entrain your brain into remaining in a more relaxed state during stressful situations and help you achieve a better work-life balance. Plug in your stereo headphones to your computer and listen to the beautiful meditation music which includes Alpha waves and nature sounds. If you'd like to learn how to meditate you might appreciate the optional guided meditation soundtrack offered in our relaxation videos. If you are looking for an anxiety cure, our guided relaxation may offer you immediate stress relief. Listen to a short sample of a free guided meditation. Because our videos are so deeply relaxing, they are also effective for insomnia relief. To learn how to meditate it is best to experiment and find what works best for you We have found that meditating with nature in a quiet place is one of the best methods for deep relaxation. There are a few simple things that are common meditation practices such as focusing on the breath and breathing slowly and deeply as you allow your mind to become still — which can be accomplished by steadily gazing upon an object or repeating a word or mantra. For those who don't always have the time or proximity to nature, we recommend you buy our relaxation / guided meditation DVD to help you get started. You can select the guided meditation soundtrack option from the main menu and you'll quickly learn how to meditate and relax while enjoying beautiful scenery and meditation music. You'll learn how to meditate while enjoying beautiful scenery and relaxing music while being soothed into deep relaxation and learn relaxation techniques in the comfort of your own home. Meditating upon nature can provide deep relaxation and offer immediate anxiety stress relief. When your body is calm and relaxed your heart rate decreases, your breathing slows down and the stress hormone, Cortisol returns to normal levels. This allows your body to heal itself because it is no longer in the "fight or flight" mode and can direct energy back to healthy mind / body functions. When left unchecked, high stress levels can lead to chronic stress which can be very harmful to one's health. By learning how to meditate, one can reduce the impact of the stress of our modern world on the body — if practiced regularly. Meditation can also provide a comforting, spiritual experience and may help some feel closer to God and discover their innermost or "higher" self. Non-believers can also reap the benefits of meditation to refresh and rejuvenate their mind and body. Meditation is widely recognized and used by the medical community as a very effective method to help patients relax and recover from surgery and a variety of illnesses. Because meditation can induce the "relaxation response" it can also be an excellent treatment tool to help those challenged with compromised immune systems. In fact, it has been clinically proven that tools that induce the relaxation response can boost the immune system and aid in healing. We believe that the Serenity Moments guided relaxation DVDs may be an excellent additional treatment tool for patients who have HIV or recuperating from illness or surgery. Of course you should use them in conjunction with other prescribed treatments by your doctor. In addition to helping reduce anxiety stress, insomnia and potentially boosting the immune system, they can also help anger management patients learn how to cope with stress and retrain their brain into healthier thought patterns so they can respond better to life's challenges. Health & wellness coaches and practitioners who special in stress management or offer stress relief techniques will find them ideal for their customers and patients. The Serenity Moments meditation and relaxation video series is a also a perfect tool for those practicing Mindfulness Meditation which has been clinically shown to be effective for the management of stress, anxiety and panic, chronic pain, depression, obsessive thinking, strong emotional reactivity, and a wide array of medical and mental health related conditions. Another benefit of meditation that our relaxation videos facilitate is enabling one to enter into a deeply meditative state so you can achieve a calm mind and make better decisions. When the mind is under duress in the fight or flight mode, the rational part of your brain is compromised resulting in poor decisions. However, when your mind is very calm, you are able to think much more clearly and are better equipped to think things through. When you are in a deeply relaxed, meditative state, you may be surprised by the myriad of deep insights and good ideas that come flowing into your consciousness. Your mind is free and open to see the "big picture" more clearly. When deeply relaxed you are able to still your thoughts, your subconscious mind is then better equipped to access the "smarter" subconscious mind — which brain researchers have declared is smarter than the conscious mind by a ratio of ten million to one. This isn't difficult to believe when you consider that all your life experiences are stored in your subconscious mind. Those who know how to achieve deep relaxation through meditation are often amazed at the deep insights they are able to glean. You may also experience the surfacing of long forgotten memories which can be very cathartic and provide inner peace, which can also help reduce anxiety related to unresolved conflicts. Thus this product will be a huge benefit to those who wish to tap into and harness the brilliance of their subconscious mind and well as help those who are suffering from stress, trauma or depression or those who desire a virtual vacation. In addition to the benefits of guided imagery, our beautifully composed meditation music offers therapeutic qualities and provides the listener with a very peaceful, relaxing experience to aid in the recovery from the stress of surgery or illness. Our soothing relaxation music is also ideal for hospice or palliative care centers and is used by hospitals, clinics and therapists. To take advantage of the brain's natural frequency following response, just below the music we have incorporated Alpha, Theta and Delta wave frequencies that will encourage your brain to synchronize naturally into a more relaxed state. If you practice meditation for relaxation or yoga our scenic relaxation DVDs will quickly transport you into peaceful frame of mind and help you relax. As you loose yourself in the exquisite detail of the beauty of nature filmed in HD and listen to relaxing music, you may experience a profound spiritual connection to God, the universe, or your innermost self and feel a deep sense of inner peace and harmony. Meditation can be practiced by people of all religions and faiths and is not exclusive to eastern religions. No matter whether you are Christian, Jewish, Hindu, Muslin, Buddhist or any other faith you will find our relaxation videos beneficial. Mind, body & spirit and new age enthusiasts may enjoy experiencing inner healing with them and enjoy using our relaxation DVDs as ambient video on TV. Continued use of our guided relaxation product may facilitate brain wave entrainment, or training your brain to remain in more relaxed state for extended periods of time. This can result in recovery from the symptoms associated with post traumatic stress disorder (PTSD), chronic stress and other anxiety related illnesses. It will also help you cope better with stressful events in your life. Brain research has indicated that relaxed brain wave frequencies can help strengthen the immune system and aid in healing from a variety of illnesses. You�re emotional and spiritual health is vital to your physical well being so be sure to nurture your mind with our scenic relaxation videos. Brain researchers and neurophysiologists have discovered that with continued use the brain becomes entrained into remaining in this relaxed state. When the brain is in Alpha or Theta wave states the brain increases the production of serotonin which is an extremely beneficial neurotransmitter that facilitates mental and physical relaxation. Slower brainwave frequencies such as Alpha and Theta waves produce endorphins that make you feel better for a natural "high". With continued use, the brain can actually create new neural pathways, heal the physical body and boost your immune system as well as help the mind learn easier. Alpha, Theta and Delta wave frequencies are natural brain wave states that can help synchronize the left and right hemispheres of the brain enabling the mind to function in concert as well as help induce deep states of relaxation. Our beautiful relaxation DVDs with nature sounds and soothing relaxation music make excellent ambient video for waiting rooms, lobbies, or dentist offices, hospitals, hotels spas or as a house party DVD. Our soothing music is also ideal as background music for massage therapy or in dentist offices. If you are interested in using our product as part of your video on demand (VOD) or closed circuit television (CCTV) or in-flight programming service please contact us and we'll be happy to license our content for use by your organization. Your customers will appreciate our beautiful relaxation videos and meditation music. If you wish to distribute our videos through your retail store, office or clinic we can offer you discount pricing. If you'd like more information, please use our Contact Form.